Bibliography: Bartsch 79; Hind 173; White and Boon first or second of two states (previously cataloged as first state, but see White and Boon on “fine reworking between Christ’s head and scroll above him” (p. 76) in second state. For student research on the DAC’s Rembrandt holdings’ watermarks vis-à-vis Nancy Ash and Shelley Fletcher’s concordance Watermarks in Rembrandt’s Prints (Washington, DC: National Gallery of Art, 1998), see object file Rembrandt Watermarks 2000. 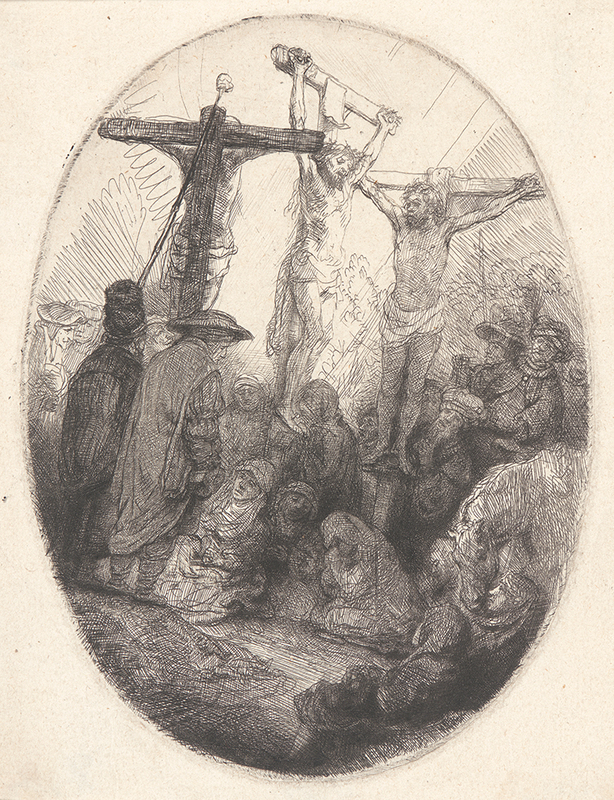 Christ Crucified between the Two Thieves: An Oval Plate, . Etching and drypoint on laid paper. First or second of two states. Plate: 135 x 100 mm (5.3 x 3.9 in.). Sheet: 149 x 113 mm (5.9 x 4.4 in.). DAC accession number 1953.D1.3. Bequest of George W. Davison (B.A. Wesleyan 1892), 1953. Open Access Image from the Davison Art Center, Wesleyan University (photo: R. Lee). http://dac-collection.wesleyan.edu/obj12005 is a persistent link to this page with no user-session information.